Our School is a Christian Japanese Pre-School. Christian songs, short prayer lead by Sensei, and thankful meal song prior to snack time will be included in curriculum. Taught by a professional that has over 35 years of teaching experience including Japanese Immersion Program. This Preschool & Pre-K Academy is for children ages 3~6 years old. You can provide payment on the first day of class. 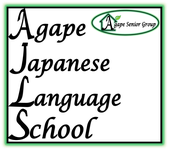 Checks payable to "Agape Japanese Language School"
If your child has attended our school within the past six (6) months and you would like to re-enroll your child please use the registration form below. No registration fee needed as long as your child has attended within the past six (6) months.